Generation WI$E: Welcome Gen Y Investors! Hi everyone, please allow me to introduce myself. My name is Tim Olsen, I'm 21 years old and a senior at Louisiana State University in Baton Rouge, LA where I'm majoring in finance with a minor in history. 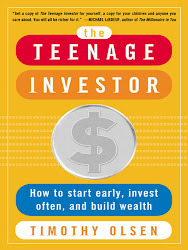 I have long been interested in investing (I bought my first stock at 8) and when I was 13, McGraw-Hill published my investment primer for teenagers: The Teenage Investor: How to Start Early, Invest Often and Build Wealth. Aside from that experience, I have interned for 5 years at a hedge fund in New York City where I worked in equity research of transportation companies. Now, 8 years later, I've matured a lot and seen the financial markets change drastically as we were faced with a meltdown of the financial system from late 2007 into 2008 brought on by the bursting of the housing bubble, excessively easy credit and lax lending policies (among other things). Now more than ever it's important for Generation Y investors - those born between the mid-1970s and early 2000s - to learn the importance of understanding not only their own finances, but the global financial system. It may sound complicated and boring but it's really not. By reading this blog, I hope to give you key tips, insight and some much-needed perspective to help you navigate the ever-changing financial markets. By checking this blog out daily, you'll get to hear my thoughts on how daily events in the financial markets will impact you, the Gen Y investor. The best part is, you will receive this information straight from a fellow Gen Y who knows exactly what you're going through! While reading this, I hope that you will ultimately notice a personal transformation: the Generation Y investor in you will become the Generation WI$E investor!